Is Yolanda Foster's Lyme Disease the Next Real Housewives Health Mystery? The sixth season of the Real Housewives of Beverly Hills jumped almost immediately into Yolanda Foster’s well-documented health issues. Since Season 4, Yolanda has talked openly about her struggle with Lyme Disease, and as she continued to look more and more ill, it became her main storyline on the show. Initially, no one questioned Yolanda’s diagnosis and she seemed to be taking the necessarily steps to getting well. However, more recently, she has been experiencing a range of symptoms and tangentially related ailments that have confused both her cast mates and viewers. Unfortunately, the whole thing is starting to resemble the brouhaha on the last season of the Real Housewives of Orange County over whether or not Brooks Ayers is faking cancer. Like the members of the RHOC, Yolanda’s fellow housewives have begun to express not necessarily doubt, but certainly questions, about her health. They’re wondering how she can look so sick one day and the next she’s posting jubilant pictures on Instagram looking fairly well. And as she has undergone a litany of treatments, they are also wondering if perhaps her issues go beyond Lyme Disease. Kyle Richards suggested that Yolanda’s issues might be related to another problem like depression. Lisa Vanderpump wonders if it’s a combination of menopause and something else, while Lisa Rinna has raised the possibility of Munchausen Syndrome, a psychiatric disorder wherein a person feigns illness. On the most recent episode of the show, Yolanda flew to Cleveland to have her leaking breast implants removed. She was hoping that the removal of the implants would help boost her immune system and aid her in fighting the Lyme Disease. About three weeks ago, a blog called Real Skeptics of TV popped up and has dedicated a series of lengthy posts to exploring the legitimacy of Yolanda’s claims. The writer, identified as A.M. Pines, is particularly offended by the pseudoscience she sees being pushed on the show and worries that it will endanger viewers. The ensuing exploration examines the timeline of Yolanda’s health issues, how Lyme Disease manifests itself and the credibility of the treatments she has received. Pines begins by looking at the rates of Lyme Disease using a table from the Center for Disease Control (which I’ve confirmed), mentioning Yolanda’s two children, Bella and Anwar, whom she revealed had been diagnosed with Lyme Disease as well when she spoke at the Global Lyme Alliance inaugural gala in October. Pines then points to what she feels is the real issue at hand: the difference between Lyme Disease versus Chronic Lyme Disease versus Post-Treatment Chronic Lyme Disease Syndrome. Post-Treatment Chronic Lyme Disease Syndrome is an after-effect of Lyme Disease treatment. Yolanda claims to have Chronic Lyme Disease. But Yolanda hasn’t called her struggle PTLDS. Rather, she has called it Chronic Lyme Disease or CLD. This term is generally applied to individuals with nonspecific symptoms and where there is no objective evidence that they ever had Lyme Disease in the past. Treatments for CLD begin with long term antibiotics and generally progress to other alternative herbs, vitamins, and therapies. This is why the CDC for example, recognizes PTLDS, but not CLD. A common tactic in pseudoscence [sic] and anti-science groups is to take legitimate ideas or issues and change them just enough to be different, but be similar enough to muddy the waters. Pines then pokes holes in Yolanda’s timeline for when she contracted Lyme Disease. As I noted last time, the timeline for Yolanda Hadid Foster’s Lyme Disease is not very clear. She claim she got in 2012, but at a gala in 2013, she said she had symptoms for 2 1/2 years, which would pin her time in late 2010. In this instagram post (screenshot), she notes 2 years 9 month nightmare, which would pin it during August 2012. Perhaps the most absorbing information is the breakdown of all the treatments Yolanda has tried. For the average viewer, these have all seemed a bit strange; though the editing of the show might be to blame, it is hard to draw a direct line between these treatments and how they would cure her Lyme Disease. 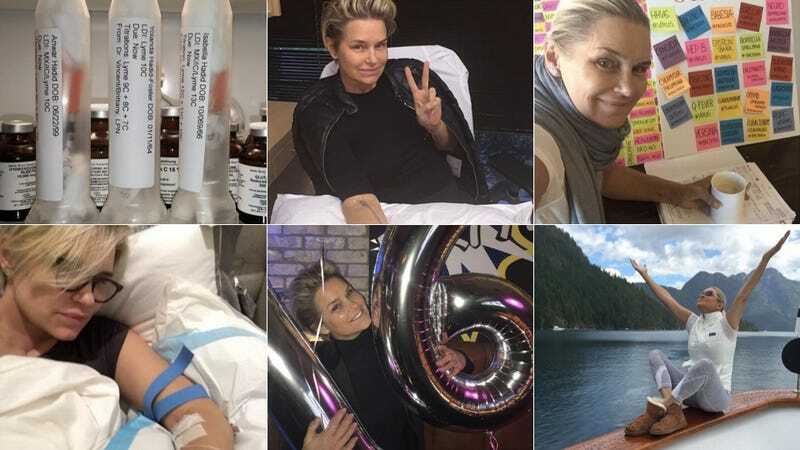 December 2014 – About a month after RHoBH, Yolanda claims her Lyme Disease relapses. KEY POINT: Relapsing is not something the medical community acknowledges happen with Lyme Disease (though again, Yolanda claims she has Chronic Lyme Disease, which is different and contested.) Studies show it is a new infection that occurs, not a relapse. The chance of Yolanda having heavy metal poisoning is so incredibly low it is nearly impossible. The only individuals who could possibly have it work in industrial trades where they are exposed to potentially dangerous and hazardous materials. Even something like lead poisoning is rare and involves being exposed due dangerous or neglectful situations (like what is currently happening in Flint, Michigan.) Low income people are among the most likely to be exposed to lead and other environmental hazards. Ultraviolet Blood Irradiation – essentially this involves putting in an IV, then blood is drawn through a UV machine then back to your body. It was a popular treatment in the 1930s and 1940s, but now has come back into vogue with alternative medicine practitioners, despite limited evidence. Pines also notes key inconsistencies from Yolanda’s interviews, like the fact that she’s claimed to have stopped wearing makeup even though there are photos of her in makeup after making that claim. She also suggests that in her Bravo blogs, Yolanda uses a lot of fancy medical language to hide the fact that the information she’s presenting doesn’t fully add up. Focusing on the most recent episode, Pines devoted an entire post to some of Yolanda’s claims about her ruptured implants. Yolanda tells Kyle Richards and Erika Girardi that two of her children have suppressed immune systems due to the that she breastfed them while she had her implants. Yolanda claims that breastfeeding with silicone implants caused her children to have lower immune systems. The FDA notes that scientifically silicon level were not higher in breast milk from women with implants versus those without implants. There have also been studies about birth defects from children born to women with implants and no increased risk was found. Additionally, this article explains specifically why breastfeeding with implants is not inherently risky. Further, Pines raises a good point about why Yolanda would go to Cleveland for an implant removal surgery when she lives in Beverly Hills, one of the plastic surgery capitals of the world. Real Skeptics of TV is not the only source outside of the women on the show asking questions about Yolanda’s Lyme Disease. Comedian Heather McDonald discussed the possibility that Yolanda might be suffering from something other than Lyme Disease on her podcast Juicy Scoop. (The conversation begins around minute 53.) McDonald and her guest wonder if Yolanda is perhaps being taken advantage of by health professionals of varying legitimacy. Which leads me to the matter of April Daisy White. April Daisy White has been a teacher, a writer, a coach, an actress, a pilates teacher, a translator, and a high class call-girl. Now she’s an all around motivator for people and artists. This is all difficult because, to a certain degree, someone’s health isn’t really any of our business. But, of course, Yolanda is on a reality show and is making a living off of sharing her business, and she is very clearly suffering from something. As was the case with the Real Housewives of Orange County, the concern that she might be spreading—unintentionally or otherwise—false information that could potentially misinform a viewer about their own health, even while she purports that she’s trying to use the show as a platform to help people, is a valid one. Personally, I found a great deal of this information quite compelling, if not wholly convincing, without losing sight of the fact that A) I’m not a scientist or doctor and B) Being bombarded with all this information in one sitting probably lends itself to making it sound more believable. Yolanda has made her health struggle her major storyline of the season so we will undoubtedly learn more about it as the season continues. If these theories start to pick up steam, it seems likely that she’ll address them in a more head-on way then she has so far, although hopefully not in such a spectacular train wreck that that Brooks Ayers’ defense. Images via Yolanda Foster’s Instagram.